This Bangkok & more small group tour is ideal for anyone wanting a short Thailand local experience holiday or a great stopover while in transit from elsewhere. It’s a great introduction to Bangkok and some of the nearby attractions meaning short travel times also. The usual friendly faces and great food abound. A glimpse of some amazing history is on offer and you can also get close up to some real monkey business amid centuries-old ruins. Then finish with some more shopping and sightseeing in this fascinating city of angels known as Krungthep by the locals. One of the worlds truly amazing big cities. (3 star hotel x 2 nights, 2 star hotels x 6 nights). 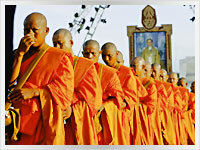 Kanchanaburi area including the River Kwai, Hellfire Pass and more, (full day). 10 meals included as per itinerary. Tonight our Bangkok & more small group travel experience tour will stay in; BANGKOK - Our Bangkok & More group tour officially starts when you check into your Bangkok accommodation. A welcoming dinner will be had in the evening. If you arrive early enough your free time could be spent visiting the enormous Chatuchak weekend market and/or, Wat Phra Kaew & the Grand Palace, Wat Pho, Wat Arun, MBK or Siam shopping centres or take a boat ride with the locals on the Chao Phraya express to some local shops in nearby Nonthaburi province. A few of the dozens of other options may be Vimanmek Teak Mansion, Chinatown, Wat Traimit, Jim Thompsons House, Silom or Sukhumvit road shops. D.
BANGKOK - A free day to get the feel of this full on amazing city. Our tour coordinator will be more than happy to make suggestions on what to see or do as well as pointing you in the right direction after you decide which way to go. As it's a Sunday the Chatuchak Weekend Market is a popular place to look for a bargain. With thousands of stalls don't expect to see it all in one day but do expect to purchase something you never even knew existed before today. From a mouse to an elephant; Although it's so big even an elephant may be hard to find. One of the worlds great markets. Bartering, (always with a smile), is the name of the game as usual. B.
Tonight our small group Bangkok & more tour will stay in; KANCHANABURI - Today our cheap tour package will travel by local bus to Kanchanaburi. Our free time after arrival can be spent visiting the Bridge on the River Kwai, Thailand-Burma Railway Centre Museum, Allied War Cemetery, Death Museum or Lak Meuang, (city pillar). Lots of great restaurant choices for dinner or graze among the street vendors with the locals for even more choices. B.
KANCHANABURI - A full days tour of the region with a local operator which among other things will include the River Kwai and Bridge, Hellfire Pass and allied war cemetery. B.
Tonight our travel package will stay in; LOPBURI - Travelling by bus through some scenic countryside via Suphanburi will see our group travel tour in the once important historical, but now monkey ruled town of Lopburi. Lopburi is one of the oldest cities in Thailand dating back to before the 11th century which accounts for some of the Khmer style architecture of the old temples. B.
LOPBURI - A free day in the historical section of old Lopburi to explore the many ruins right beside or close to our accommodation. These include The former royal palace of Phra Narai Ratchaniwet, Wat Phra Si Ratana Mahathat, Prang Khaek and Prang Sam Yot with the latter usually covered in the local monkey population. We may also see a monkey or two roaming freely around town. Lopburi also has a great night food vendors market which sets up daily in the nearby streets for dinner with the locals. Another chance to taste some great Thai food that very few tourists get to try. Hoi Tawt, (mussels in batter), is just one of the local favourites that can be had for a few baht only. Bring a beer or other cold drink to your roadside table and enjoy. A true local experience. B.
Tonight our cheap small group tour will stay in; BANGKOK - A short morning train trip sees our small group tour return to Bangkok. The number 53 bus from Hualamphong station on arrival will show you how the locals get around. The rest of the day is free. 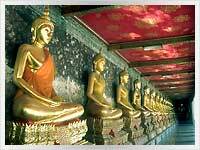 B.
BANGKOK - A last free day to do some last minute shopping or sightseeing in the City of Angels. Another chance to visit Chatuchak Weekend Market maybe? Whatever you decide boredom won't be a part of it. Bangkok; whether it's love or loathe, is one of the worlds not to be missed amazing cities. Very few don't love it for a few days at least. A farewell dinner will be had in the evening. B. D.
Our Bangkok & more small group travel experience tour is officially over when we check out of our accommodation. The Big Mango has now been ticked off the bucket list. An airport transfer is included also. B. Are there any real travellers who have never experienced Bangkok? One of the worlds most visited cities and now you know why.